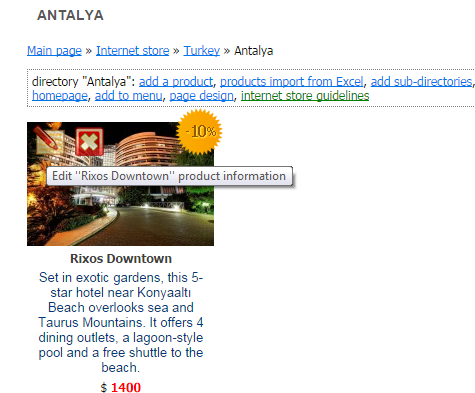 In this example we will create a tourism agency Internet store. 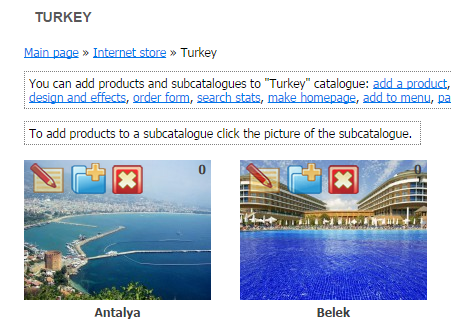 In this particular store we will create directories «Turkey», «Egypt», «UAE», «Thailand», «Tunisia», «Maldives». 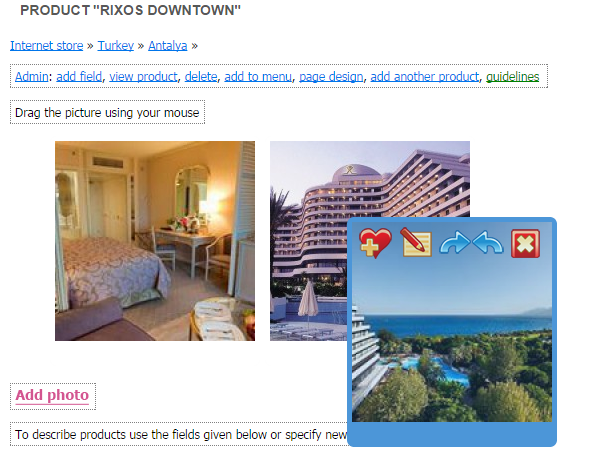 For the «Turkey» directory we will create subdirectories «Antalya», «Bodrum», «Dalaman» and add products to these subdirectories. In the website management system in the upper navigation menu choose menu item "Content", then "Internet store". 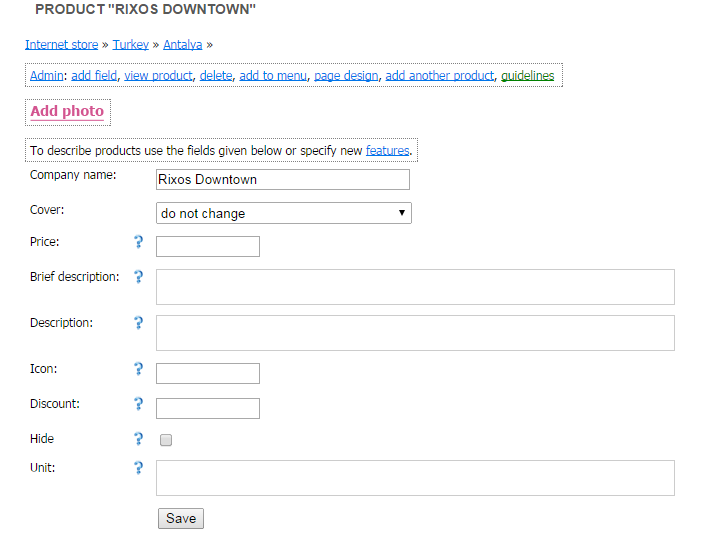 To create a product directory, click on the "Add a directory" hyperlink. Enter the directory name. For example, write «Turkey». Upload a cover for this directory from your computer. 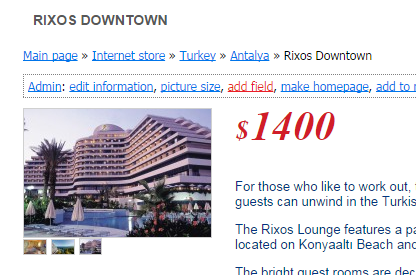 To do so, use the hyperlink "Add a directory" and use the same directory creation principle as in «Turkey» example. To edit directory name and cover, use the editing buttons on the upper side of the covers. To add a subdirectory to the directory, use the editing buttons on the upper side of the covers. Let’s add subdirectories to the «Turkey» directory. In the pop-up window enter the subdirectory name and add an image for the subdirectory cover. Go to «Internet store» section, and then use the -> "Rearrange directories" hyperlink. Use the buttons to change the directory placement in the list. 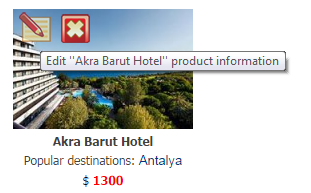 To add a product to the subdirectory, click on the directory cover (for example, «Antalya») and click on the «Add a product» hyperlink. In the pop-up window enter the product name and upload a product cover. 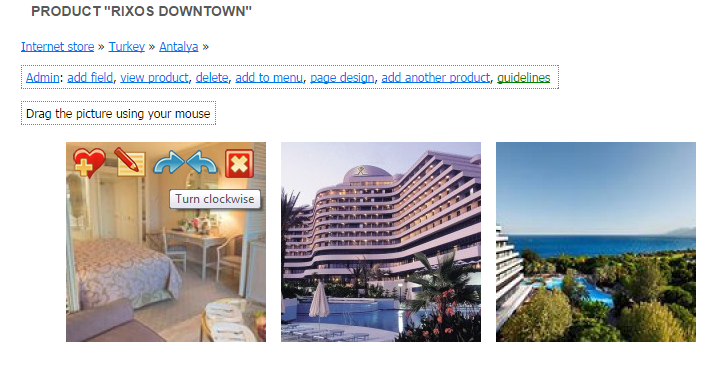 Then in the newly opened page edit the newly created product; you can upload another image and specify basic features. After clicking the «Save» button you will be redirected to the product page. 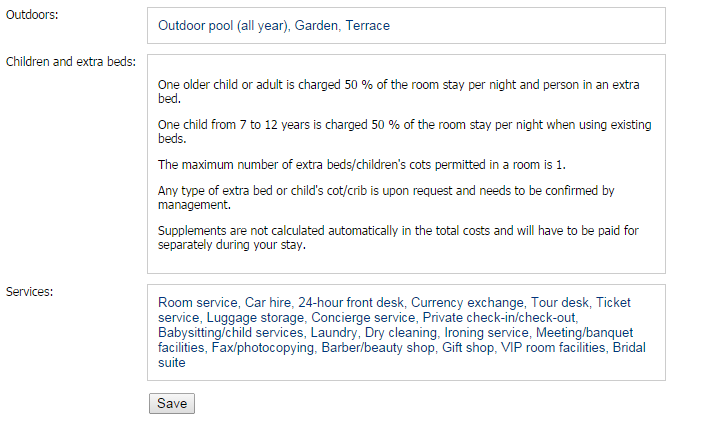 Suppose we need to add additional fields to specify product features, such as «Official category of the Hotel», «Hotel’s year of construction», «Description». To do so, use the "Add field" hyperlink. The default product characteristics are in the left column. The user created features are in the right column. By using the «right» and «left» arrows, you can add or remove features that will be displayed while viewing the product. In the newly opened page click on the hyperlink «Create a new product feature». 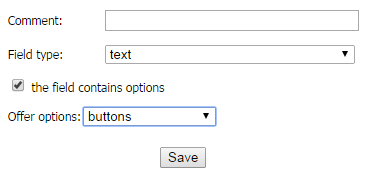 For each field we selected the field type: text or number, and entered the desired settings for each field. 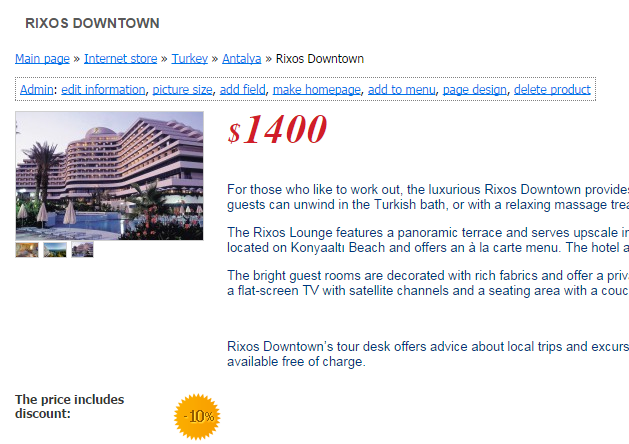 Then we added the necessary features from the left column to the right column and clicked on the «View the directory». After this we clicked on the «Edit product information» on the product cover. In this editing mode we entered the necessary data for the product and clicked on the «Save» button. Go to the product viewing page: «Internet store» -> «Directory» -> «Subdirectory» -> «Product» -> «Add field» hyperlink. Add the desired feature. For example, «Food & Drink». When user makes a purchase, we need him to decide for himself, what kind of option he wants. For example: HB (two meals per day), BB (breakfast only) or AI (all inclusive). To let the user choose, let’s make a new product feature for all directory products, and in the «Food & Drink» field we will enter the hotel meal variations data that will be offered to the user. Then let’s go to the product editing: «Internet store» -> «Directory» -> «Subdirectory» -> «Product» -> «Edit product information» hyperlink. 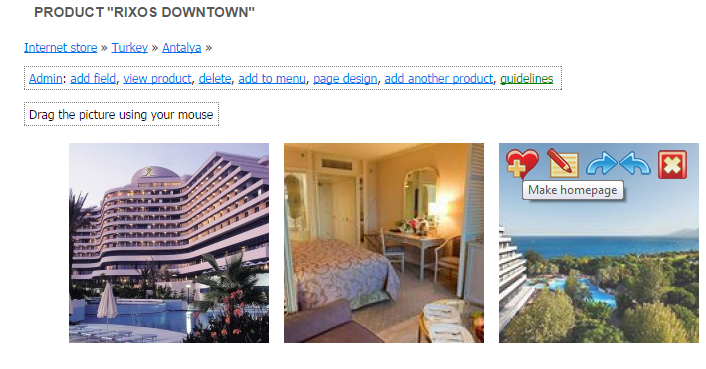 In the newly opened page enter the selection options for the user in the «Food & Drink» field. Important! The options for choosing must be written in one line, separated by the «|» symbol. In our case it’s «AI|BB|HB». To type the «|» symbol in the Russian keyboard mode, hold the «Shift» key and then press on the «\» key. Then click on the «Save» button. To add additional information to the product cover go to «Internet store» -> «Directory» -> «Subdirectory» -> click on "«Features in the directory» hyperlink. Choose the features you need to show on the product cover under the product photo. To choose the feature, move it from the right column to the left column. For example, move features «Price» and «City» from the right column to the left column. 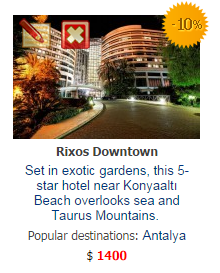 To view the result, go to the «Antalya» directory. To do so, click on «Main page» » «Internet store» » «Directory» » «Subdirectory». If after adding the additional information the cover height has changed because of the number of characters in the cover, we recommend changing the product cover photo width. To do so, please go to the «Cover options» section and set the optimal size for the cover image. НClick on the «Internet store» -> hyperlink and choose the necessary directory. A window with directory products will open. Click on the «Rearrange directories» hyperlink. By using arrows change the product placement in the directory. Choose the photo, and then use navigation buttons that appear on the top of the image when the mouse cursor is over them. Click on the «Make homepage» button. By default the first uploaded picture in the product picture gallery is set as the product cover. Go to the product overview page using these links: «Internet store» -> «Directory» -> «Subdirectory» -> «Product» -> «Edit information». To change the picture order you just have to drag and drop the pictures with your mouse. Suppose we need to change the main directory photos, such as «Turkey», «Egypt» etc. Go to the «Internet store» -> section, and then click on the «Cover options» hyperlink. 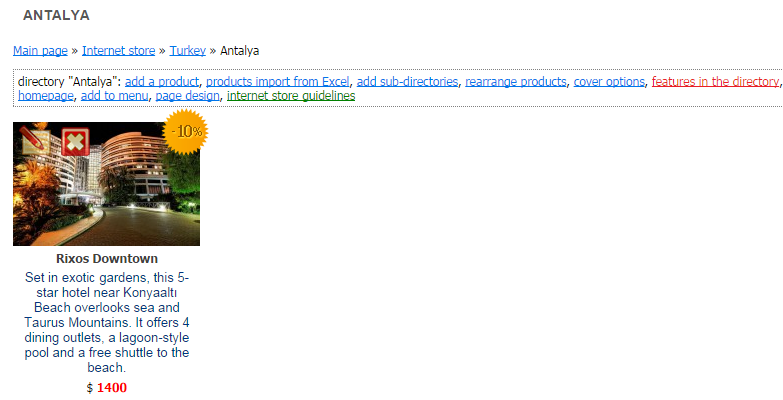 Go to the «Internet store» -> section and click on the cover of the directory containing the product. Choose the necessary subdirectory, and then choose the necessary product. On the product page, click on the «Picture size» hyperlink. 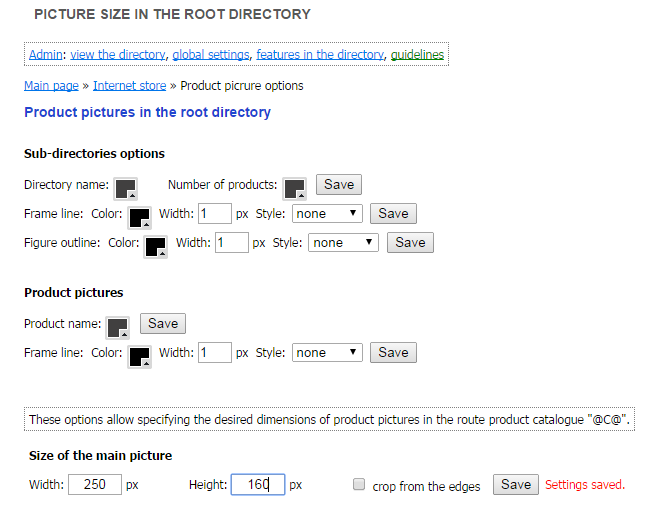 Then set the image parameters for the image that the user will see when opening the products page in the directory. Important! These image parameters are applied to each product of the current directory. 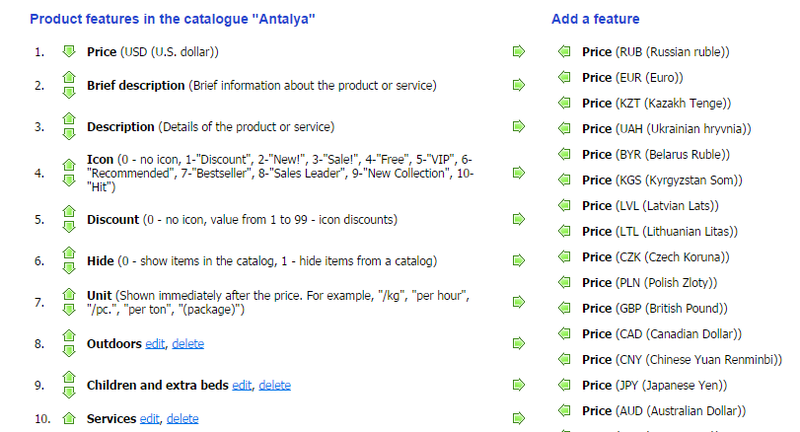 In our case these image parameters are applied not only to the selected product, but also for all products in the «Antalya» subdirectory. To view the result, use the «View the directory» hyperlink, and click on the product image. Go to product overview using these links: «Internet store» -> «Directory» -> «Subdirectory» -> «Product» -> «Edit information». Choose the image and then using navigation buttons that appear on the top of the images when the mouse cursor is over them, click on the «Edit product information» button.